This June, two University of Wyoming zoology students started research projects investigating the life cycle and habits of sauger in the Wind River drainage. 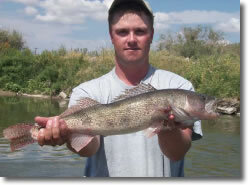 The sauger (Sander Canadensis - a member of the perch family) is an important but poorly understood native fish in the Wind River watershed. 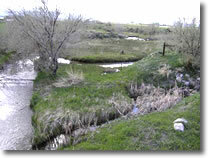 Mill Creek, which flows over 20 miles from its headwaters near Cedar Butte to the Little Wind River, is a poster child for the many problems affecting small streams in the Wind River watershed. The Wind River Alliance has been awarded a 2004 Five Star Restoration Grant for a stream restoration and community education project on the Middle Fork of the Popo Agie River. 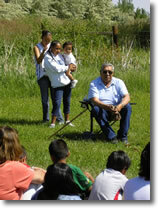 Wind River Alliance, in cooperation with Wyoming Indian Elementary School and the Natural Resource Conservation Service (NRCS) is developing a Native Garden on the grounds of Wyoming Indian Elementary school. Recognizing that human health and the health of our watershed are inextricably linked, Wind River Alliance will be undertaking a new environmental justice research project this fall. 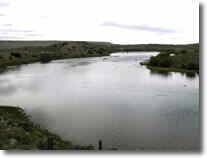 The broad, long-term goal of the project is to improve the health of Reservation residents by reducing human exposure to multiple environmental contaminants within our waters.